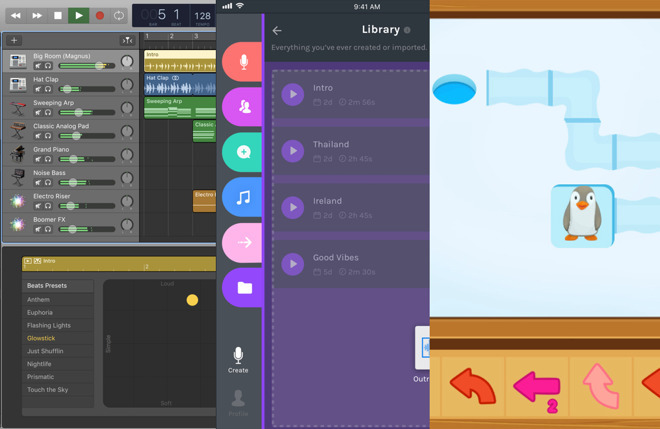 This week's app highlights include changes to GarageBand and Final Cut Pro X, the podcasting tool Anchor arriving on iPad, and the Hopster Coding Safari teaching young children some of the core concepts of programming without learning a language. FreeTime Unlimited is an Amazon service that provides access to books, movies, and TV shows for children between 3 and 12. 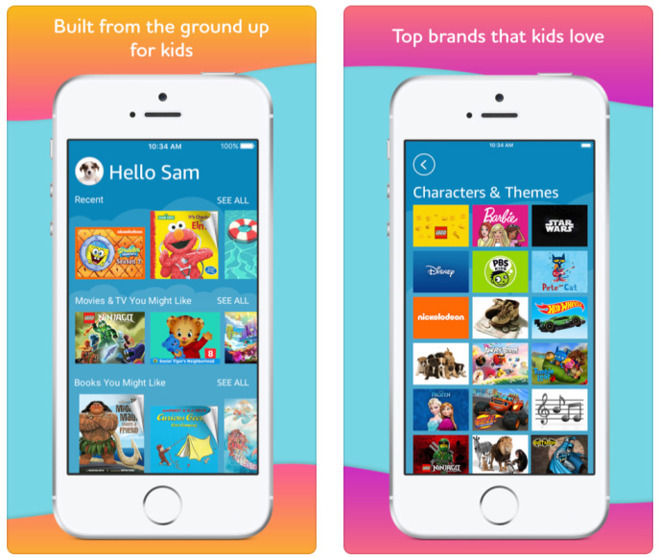 A single subscription can be shared between four kids, each with their own profile, and across multiple devices. Monitoring and filtering options are available for parents. The service is now on iPhones and iPads for the first time. A subscription is normally $2.99 per month, but can be tried free for the first month. Get it for iOS: $2.99 per month. Requires iOS 9.3 or later. New to the music creation tool are free downloadable Artist Lessons, in which the artists behind songs show users how to play them on piano or guitar. Apple has also added 400 animal, machine, and voice sound effects, 5 Vintage Mellotron patches, and 1,000 new electronic and "urban" loops for genres such as reggaeton and future bass. Two new Drummers will play roots- and jazz-based brush styles. Added traditional instruments include the guzheng, the koto, and taiko drums. Apple's professional video editing suite now supports viewing and editing ProRes RAW files from DJI's Inspire 2 drone with the DJI D-Log setting. Bugfixes solve problems with deleting unused render files from a Compound clip in the browser, and audio channels being unintentionally mixed down when importing Panasonic P2 video. Get it for macOS: $299.99. HearEQ is not exactly new, but it is noteworthy. We like it because it exists to help with ear training for audio production. 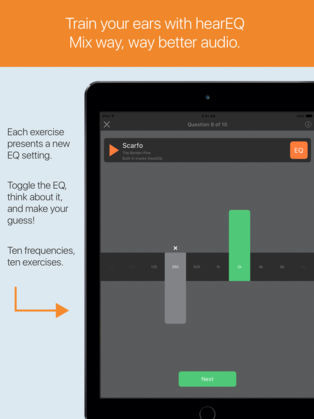 Explore different EQ settings and learn about how each one changes what you hear. You can train on a couple frequencies to start, then work up to all 30 frequencies over time. It has a 10 or 30-band equalizer, and you can use your own music files to practice on. There is a paid upgrade for a pink noise track, but you should be aware that you can load your own pink noise into your music library and use that without having to pay - something the developer has made people aware of in the App Store. Get it for iOS: $5.99. Requires iOS 10.0 or later. Compatible with iPhone, iPad, and iPod touch. VinoCell exists to help inventory your wine cellar, or in our case, fridge. Suppose you had a wine fridge, with four shelves that can hold bottles two-deep, one level tall. How do you keep track of which bottles you have and which are in front or back? Then suppose, you spent more money, upgraded to a fridge with six shelves, two-deep, holding bottles stacked 3 rows high each, and the back row has one less position across than the front one? It gets complex fast, especially when you're looking for a specific bottle. VinoCell lets you select the layout of your storage, create shelves, and then add bottles to the shelves so that you can locate where an exact bottle is every time. Because it's an app, a web app, and a cloud service, your bottles synchronize, and are editable where you need them. It's also possible if you've been keeping inventory in a spreadsheet to import a CSV and work with it. Exporting a CSV and PDF are also handy. Basically, it's almost the perfect app for an avid wine drinker with a collection of bottles in the house. It takes some time to get things set up just-so, but once you have, it's so much nucer than pencil and paper, or trying to map excel cells to physical shelf spots. Get it for iOS: $9.99. Requires iOS 9.0 or later. Compatible with iPhone, iPad, and iPod touch. 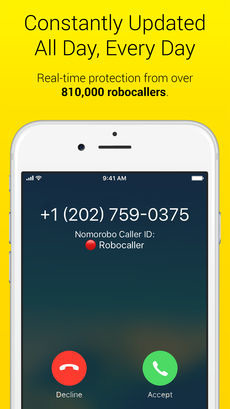 Nomorobo has stopped over 730,209,686 robocalls, or so they claim. The neat trick is that they let robocalls that you want (emergency announcements, school closings, prescription reminders and so on) through. It's a simple one-time setup, and landlines are covered for free. Mobile numbers require a $1.99/month subscription. If you're inundated with these calls and can't stop them, this might be one solution. Get it for iOS: Free, with in-app purchases. Requires iOS 10.1 or later. 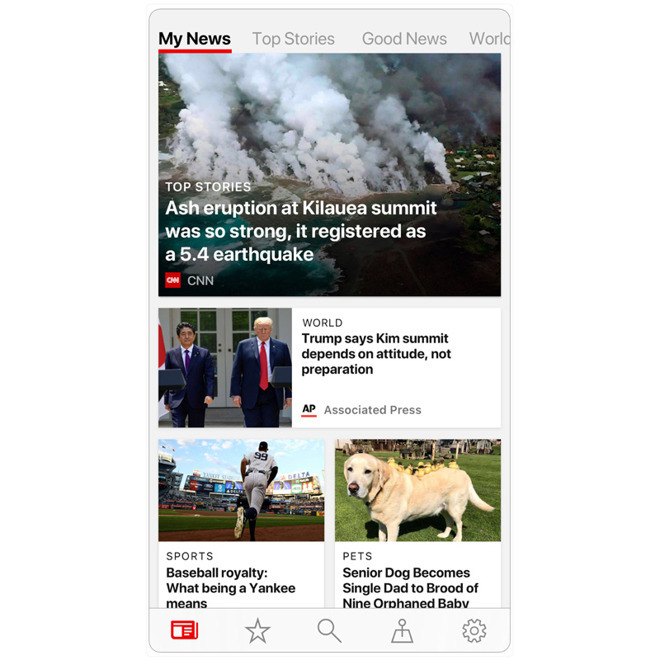 Compatible with iPhone 5s, iPhone 6, iPhone 6 Plus, iPhone 6s, iPhone 6s Plus, iPhone SE, iPhone 7, iPhone 7 Plus, iPhone 8, iPhone 8 Plus, and iPhone X.
Microsoft has redesigned its iPhone and iPad client with a new look, including a dark theme and continuous reading. Another focus is personalization, including the ability to customize followed topics and local news, and carry these interests across platforms. The company has also added a new iOS widget, and made it easy to set up alerts for breaking news. Designed with early-year advisors and ICT teachers, Hopster Coding Safari is a game that teaches some of the core principles of coding. While it does not teach a programming language, users will gradually be introduced to fundamental concepts in programming, including pattern recognition, algorithms, abstraction, and decomposition. The game is presented as a series of puzzles, gradually increasing in difficulty across 70 levels. Initially players are asked to build paths, before using arrows to determine movement, and then later the game introduces commands and simple loops. As the game goes on, players are rewarded with animal stickers that can be placed into a virtual sticker book. As it is aimed at younger users, Hopster Coding Safari is both free to acquire from the App Store, and does not display advertising. There is also no requirement to be able to read, allowing it to be playable by children as young as two years old. Get it for iOS: Free. Requires iOS 6.0 or later. Anchor has expanded its podcast creation, publishing, and distribution tools by producing a version for the iPad. 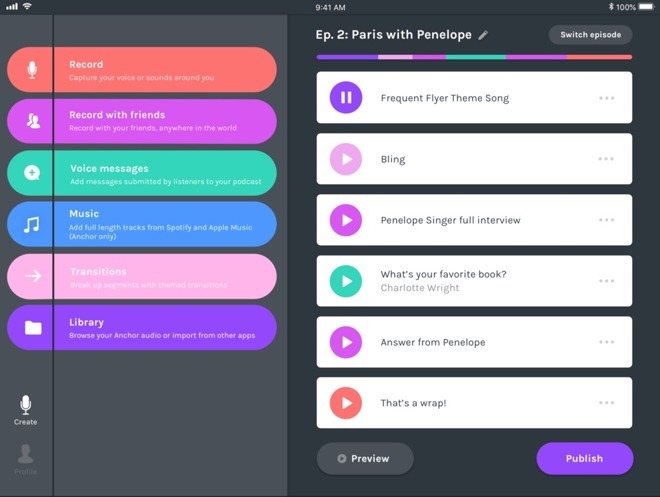 Following on from the iPhone version, the iPad variant takes advantage of the larger screen to make it easier for users to make changes to their recordings. 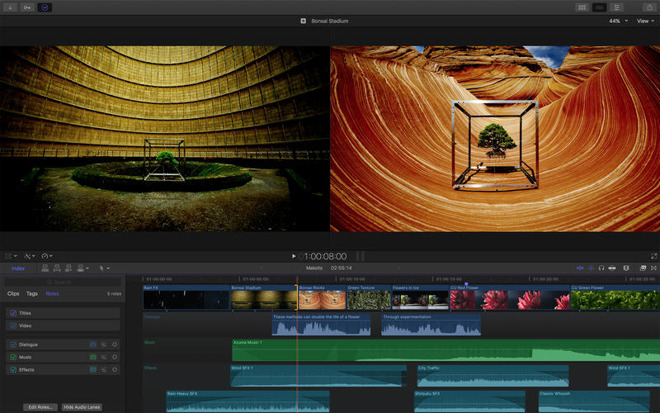 Entering into the editing tools, recordings can be split into multiple segments and used across multiple episodes, with transitions, jingles, and other types of audio from other apps able to be inserted into the show. It is even possible to use drag and drop to transfer audio files from another app into the project, which can then be shifted into the right place ready for publication. The app also supports iOS' other multitasking features as well, such as Split View for reading show notes while recording. Lastly, the app also allows users to plug in their own microphone using the Lightning port, either directly or with a Lightning-to-USB adapter, though there is always the option of simply using the iPad's onboard microphone. Get it for iOS: Free. Requires iOS 9.0 or later, also works with iPhone and iPod touch. Billed as an easier way to tag photographs and images, QromaTag for macOS can help users by minimizing the amount of work a user needs to perform on an image collection. At its simplest, QromaTag has a powerful autofill feature that can help complete contact names from simply typing a few characters. A key feature is its voice recognition-based feature, which can do away with typing tags entirely. After tapping a designated key, the user can speak aloud about the image and its backstory, then tap the key again to automatically apply relevant tags. The app can extract important information from the spoken description, including full names of people in the photographs, places, times, and even adding the full names for people referred to by other titles, such as Mom and Dad. Get it for macOS: $29.99 with a 40% introductory discount until July 7, with a seven-day free trial. Requires macOS 10.11 or later. The iPhone management software iMazing's spring update adds ringtone management for the first time, allowing users to extract existing ringtones to their Mac or PC, as well as add new ringtones to their mobile device. 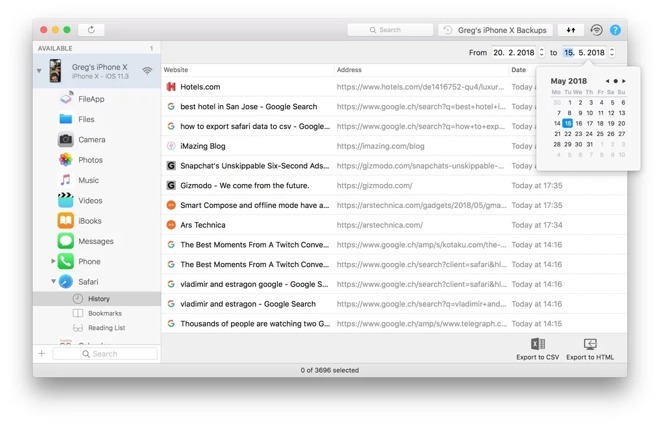 Safari data can also be extracted, with bookmarks, reading lists, and browsing history able to be pulled from an iPhone. It is also now possible to browse the iPhone's calendar using the tool, including the ability to search individual calendars by date range, and to export events to CSV or iCal formats. There are also improvements to the way it handles CSV exports, the wizards have been changed to make them resizable, and other performance optimizations. Get it for macOS: $39.99. Requires macOS 10.8 or later. Though not a release, Feral Interactive has announced it intends to ship Total War: Warhammer II on macOS this year. Pricing, system requirements, and a release date were not advised. Total War: Warhammer II combines the Creative Assembly's real-time strategy game with Games Workshop's table-top war game, with players controlling armies made up of legendary heroes, spellcasters, dragons, and mutated mounts to control the Great Vortex. Aside from the RTS elements, the game will also feature empire-building activities, where players need to manage settlements, recruit for their armies, negotiate alliances, and if necessary, wage war. 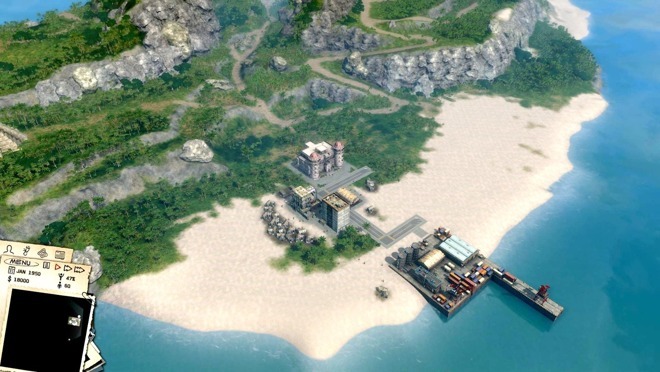 Feral Interactive has also announced it will be bringing Kalypso Media's Tropico to the iPad later this year. While the date is unknown, it will be released as a paid premium title, with no in-app purchases. Playing the role of El Presidente leading a resource-rich Caribbean island nation, players have to build and maintain infrastructure and the economy, while also appeasing local political factions. The nation can be turned into an industrial metropolis, vacation paradise, police state, or a balance of all three. For the move to iPad, the game has been optimized with touch controls and an easy-to-navigate user interface, simplifying the process of issuing edicts and developing islands. Lily is a self-described Playful Music Creation application. 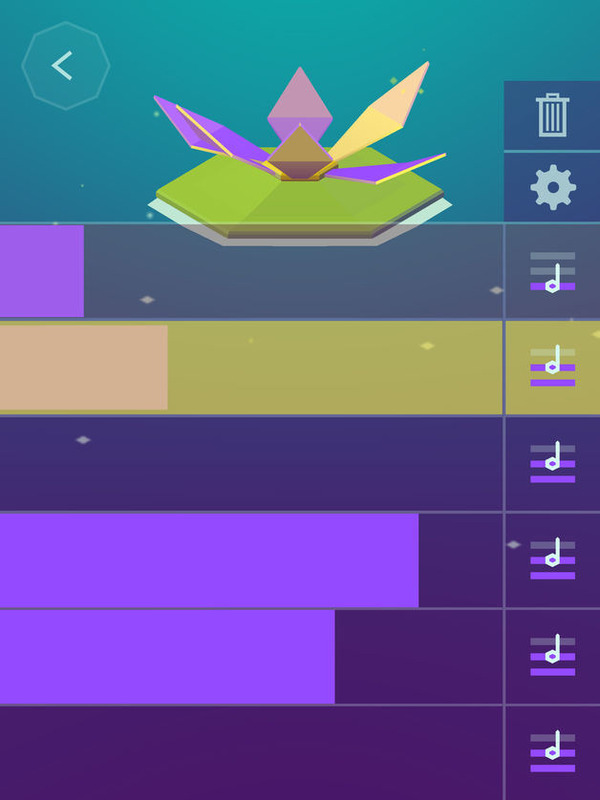 The App Store editor's notes say, "We never expected a lilypad to unlock our musical abilities. Yet here we are, somehow carving beautiful melodies from a selection of them. Lily isn't entirely whimsical, however: its lilies are essentially deft musical instruments providing organic lessons in scales, harmonies, and tempo. Be sure to save and upload your compositions, too." And that's a pretty good description. You can loop melodies using six different lily flowers with their own sounds, across three octaves. You can alter the number of flower petals to change the length of the melody. There are new icons, new lily creation screens, and you can start sequencing right away. 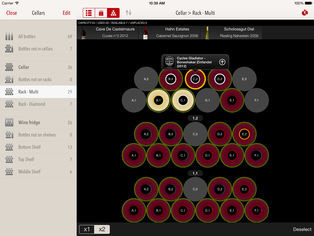 It's a fun app, and we're pleased to see people carrying on the tradition of music creation in unique ways on iOS. Get it for iOS: $1.99 with in-app purchases. Requires iOS 9.0 or later. Compatible with iPhone, iPad, and iPod touch.